Allsvenskan 2015 has been truly amazing. Sure, there wasn´t much drama at the bottom of the league, but at the top the excitement lasted all the way through the last gameweek, with IFK Norrköping finally ending up as Swedish champions in 2015, having finished 12th the season before. Quite a remarkable development that I´m sure no one saw coming ahead of the season, I certainly didn´t, but Norrköping didn´t just win, they did it playing very entertaining football throughout the season with a squad consisting of a mixture of very interesting young prospects (Fransson, Wahlqvist, Bärkroth) and more experienced proven quality (Sjölund, Johansson), with golden boot winner Emir Kujovic being the main man scoring 21 goals. In the end, Janne Andersson added almost 19 points to his teams tally compared to bookie expectations. To round of the season on a team level (I will be back later with player stats), I thought I´d have a very quick look at the shooting statistics posted by all teams in the 2015 season. Unfortunately there´s very limited data available publicly on Allsvenskan, so we´ll have to settle with some basic shot ratios and conversion numbers. In the bigger leagues, the Shots on Target Ratio (Shots on target For/(Shots on target For + Shots on target against)) does a pretty good job explaining what has happened on the pitch and usually shows a pretty strong correlation to points won. In short, creating more shots on target than you concede is, to no great surprise at all, a very good idea. 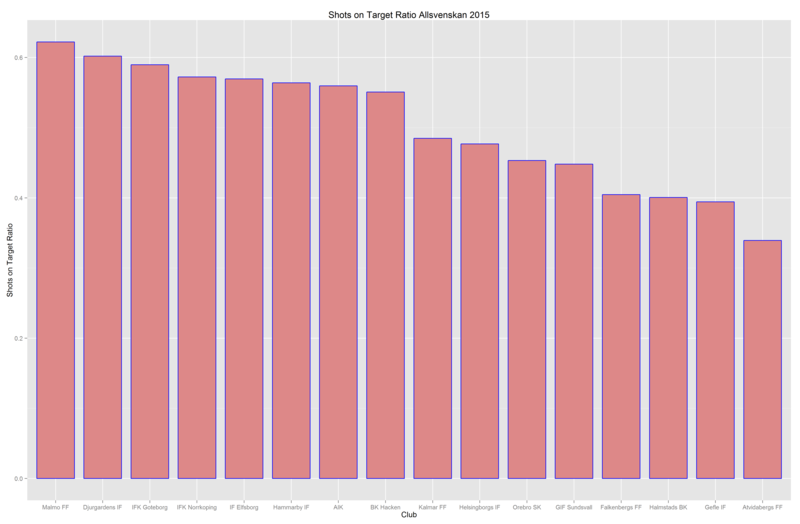 The chart below looks at the final Shots on target Ratios for all teams in the 2015 version of Allsvenskan. The champions of 2013 and 2014, Malmö FF, actually posted the best SoTR, yet ended up in fifth place. Djurgården finished just behind Malmö in the league table, and did so in the SoTR ranking as well. Newcomers Hammarby finished 11th in the league table but posted some quite strong shot numbers, and might be due a regression in 2016. 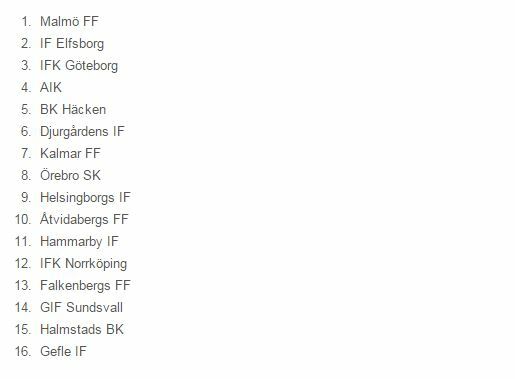 In the bottom, Gefle sticks out. As they have been doing for several seasons in a row now, they posted some very mediocre shot numbers once again, yet stayed well clear of relegation, finishing 10th in the league. Apart from them, the teams with the worst Shots on target ratios are the teams that did end up in the bottom of the table. Both Åtvidaberg and Halmstad have been posting some very bad numbers from the very start of the season, and were never really close to avoiding relegation. The chart above shows the Score%, that is the percent of shots on target that each team scored during the season. Right away we can see that reigning champs Malmö were let down somewhat by their finishing, as they scored 24.7% of their shots on target, which is bang on the league average. Way below the league average, at a measly 19.3% we find Hammarby, which helps to explain why they didn´t manage a better place despite posting some good numbers as far as shot volume goes. Gefle finished the fifth biggest share of their shots on target in the league, which in complete contrast to Hammarby, helps to explain why they finished way better than their shot volume implies. Whether Gefle are taking some very good (but few) quality chances and Hammarby worse ones (but many) than the league average is very hard to tell with the data available to me, but my hunch would be that they both might be in for some regression in the future. When we turn out attention to the other side of the pitch and look at the Save%, that is the percent of shots on target conceded that a team managed to save, Djurgården and Hammarby make up the bottom 2, whichs further explains their drop down the table compared to their shot ratios. 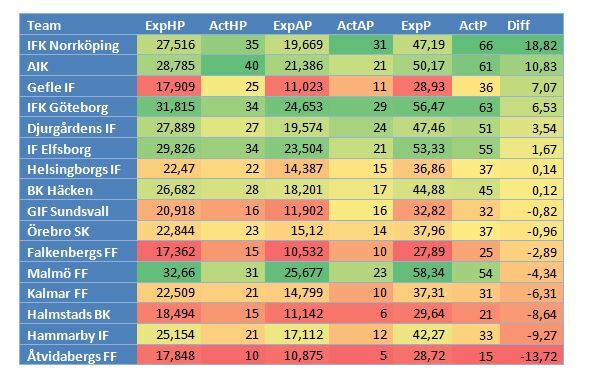 Malmö is once again very close to league average with their 74.4% of shots on target saved, which is some way from the 81.5% of IFK Göteborg and 77.7% of IFK Norrköping. Another one of the top sides, Elfsborg, does really poorly. Conceding high quality chances or being a tad unlucky? Bit of both? Interestingly, relegated side Halmstad did quite well in this respect, conceding the third lowest % of their shots on target allowed. However, when you concede the fourth most shots on target in the league while creating the third least shots on target in attack, the fact that you save a good amount of the shots you concede might not be enough. Defensively, IFK Göteborg really stand out. They conceded the least shots on target (119 compared to IFK Norrköpings 148 for instance) and saved the highest % of the shots they conceded. A lot has been said about how they missed central defender Thomas Rogne dearly once he got injured, which is probably true, but overall the loss of striker Lasse Vibe was probably a bigger blow as Göteborgs attack just wasn´t up to par with the best teams in the league. They scored the sixth most goals in the league, but only took the 10th most shots on target. Numbers like that make it hard to win any league, even with a very solid defensive output. 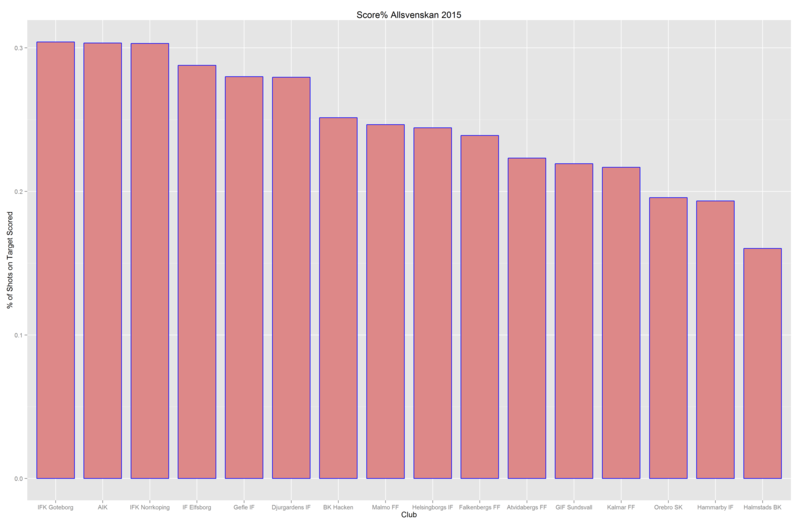 Way back in April I had a go at subjectively predicting the outcome of Allsvenskan 2015. Let´s just say I did not do too well. For the next season I plan to make some sort of mathematical model instead, as subjective guess work clearly isn´t my strong suit. Wish me luck! 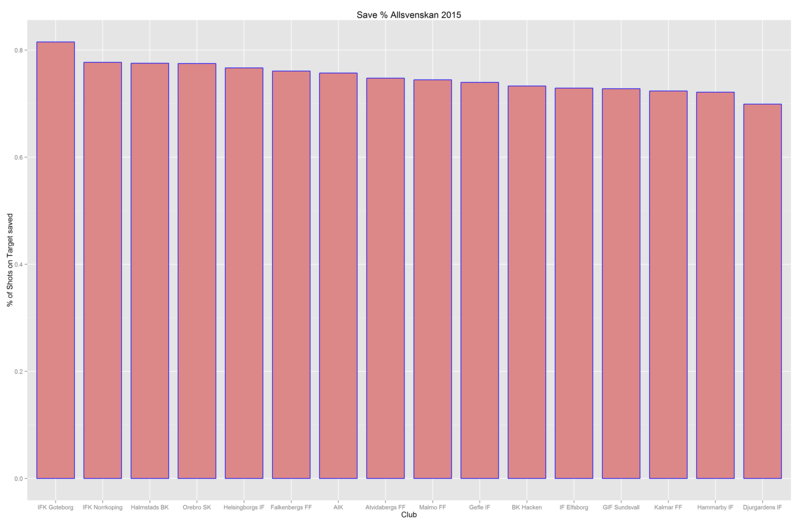 where did you find the performance data for Allsvenskan? A lot of leagues are covered on various sites, but for Allsvenskan you get the absolutely most basic stuff only it seems.